Citation: C N Trueman "Christopher Wright"
Christopher (‘Kit’) was one of the conspirators in the 1605 Gunpowder Plot –the plot to kill James I and members of Parliament. Christopher was ‘luckier’ than some of the potters – he was shot of November 8th and escaped the butchery of being hung, drawn and quartered. In 1596, Elizabeth I fell ill and many in government believed that some Catholics might have taken advantage of the situation. As a result, both Christopher and John Wright were arrested and put in the Tower of London – along with Robert Catesby and Francis Tresham. They were all released once Elizabeth had made a full recovery. Christopher Wright was also involved in the plot in 1601 led by the Earl of Essex, Robert Devereux, to remove Elizabeth from power. This was a failure and all those involved could have expected the most severe of punishments. In fact, the authorities saw Wright as having a minor part in the plot and he was sent to prison as opposed to being executed. In 1603, Wright visited Spain in an attempt to get Philip III to support a Catholic uprising in England. This visit also proved to be a failure but it is said that he met up with Guy Fawkes in Spain who was attempting to do something similar. 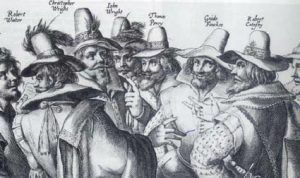 Christopher Wright joined the other conspirators in their quest to blow up Parliament and kill James I and as many members of Parliament as was possible – the Gunpowder Plot. The letter sent to Lord Monteagle led to the authorities being alerted. The cellars were searched, Guy Fawkes was found and the other conspirators put into place their plan should the plot fail – flee London. The torture of Fawkes gave the authorities the information they needed. Wright’s link with Monteagle has led to some believing that he was the betrayer of the others and was shot to keep him silent. Wright’s sister, Ursula, had married Marmaduke Ward. Ward’s brother was Thomas Ward – the servant of Lord Monteagle. Therefore, the servant of Monteagle was Wright’s brother-in-law. The Victorian historian, Henry Hawkes Spink, believed that the family connection between Wright and Ward led to Wright pressurising the Jesuit Oldcorne into writing the warning letter sent to Monteagle. However, none of this can be proved. Those who had fled met at Holbeche House in Staffordshire. On November 8th, men led by the Sheriff of Worcester surrounded the manor house. Wright and the others in the house refused to surrender – presumably as they knew what would happen to them once they had been captured. In the ensuing firefight, Christopher Wright was shot dead. His body, along with the others who were killed, was stripped and his clothes taken, probably as souvenirs.